For you I am not t hat “little Troll”, I am the big fat reminder of how you misrepresent people you talk to, you know the one you cannot intimidate with your tubby words. You clime I am a liar for not answering you, at the end of your list of my answers. Anyone willing to read back through the blog will see how you sidestep my questions so you do not have to admit to the truth. “”Wow, Parkman, you lie so much this has not happened in your life, so are you saved? I can keep going and show that works are required according to your prophets and leaders. As long as you pretend that being saved (receive eternal life) and entering the Celestial Kingdom are the same thing you will never be able to understand the truth. Besides showing examples in the Bible about the term generation, I asked you if you were willing to use your same standard in evaluating the bible as you do in examining the rest of God’s word; and all you do is sidestep the answer. All I want to do is get you and I to agree on what the term generation means when used in the Bible and in other revaluations, but you do not seem to want to be pinned down to hard facts. As long as you will not pin yourself down you can bounce around with your pam and call me the bad guy. There are just two questions for now, let’s see if you can stay on them. 1. Why is there a Day of Judgment? 2. Will you be willing to examine the word generation as used in the Bible and be willing to apply its Biblical definition to God’s other teachings? 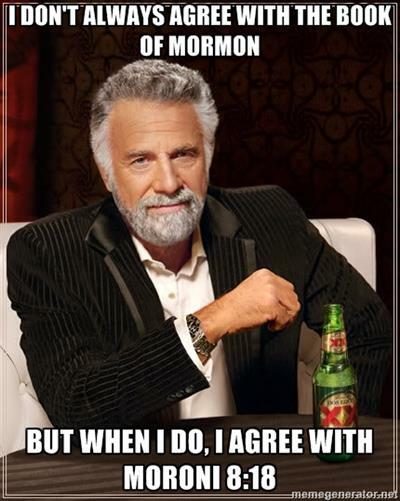 No parkman, you can claim all you want you answered me, you have not and you in turn keep asking more questions, I’m done with you, you remind me of a small handful of other Mormons that have passed thru this blog, they played the same game, Dodge questions, ask more and claim I am the one ignoring them. Also I notice that both Falcon and Mike R have claimed you have dodged questions and asked more. So you and everyone else reading needs to ask themselves this, Are me, Mike and Falcon talking behind the scene and conspiring to get you by saying your dodging questions, or are we all just noticing you doing this and saying something because in fact you are? It is because you are. Since you show no desire to examine your double standards, I will post it for others to see. Parkman, this comment has been deleted because it was directly copied from a FAIR article — a violation of the Mormon Coffee comment policy. Please familiarize yourself with the policy and conform your future comments to it. Thank you. Parkman, what exactly are you going to post? I answered questions and you did not. Even the two newer people have noticed your crazy actions and lack or reading skills and lack of posting. So Again, what exactly are you going to post and what makes you think anyone here will or does take your serious? Parkman, I did not read what you posted before it was removed. But it just tells me that if you need to go to fair for answers, then your not thinking for yourself, you are letting a group that holds no authority to speak on behalf of the church speak for you. This backs up everything everyone one says. You don’t care what we believe and you only want to believe what you want to believe. Yes, I relied heavely on some articales at FAIR, but if you were to check it again, you will see there was enough personal information used to have made the posting mine and not a direct copy of the source document. My mistake seemed to be that I relied on university defination of copying someone elses work when presenting a paper and not your defination. sorry! As you suggested, I did recheck your comment. Of the 295 words that comprise your comment, 13 of them (a partial sentence) are your own. You made another 8 word substitutions (e.g., the original used “utter” and you substituted “speak”), and you deleted one word (i.e., the original said “time period” and you said merely “time”). As requested earlier, please familiarize yourself with the Mormon Coffee comment policy and conform your future comments to it. I see that you have not yet done so, for posting a comment regarding comment moderation is also in conflict with the policy.